By Dave Winer on Sunday, February 07, 2010 at 10:44 AM. David Weinberger asks: "After press conferences, what?" Imho: A hybrid of newsroom and press conference. And it must be open, unlike newsrooms and press conferences of the past. A few years ago I wrote about an idea called Hypercamp, a way of distributing ideas and news that I felt would come into existence in what we now call the "rebooted news system." The idea became real for me at a Microsoft press event at the Palace Hotel in 2005. Ray Ozzie introducing himself as the new CTO. After the event we all went upstairs to a small ballroom where there was all kinds of food and refreshment and a mix of bloggers, developers, reporters and Microsoft execs. The party went on for a couple of hours with people reporting live from the event out through their blogs. The coolest thing was the collaborative writing that happened, that usually doesn't happen in the blogosphere because we all write holed up in isolated cubbies. It dawned on me that this was a hybrid press conference and newsroom. So imho what happens in the rebooted news system are open newsrooms. I'm not talking about virtual (online) newsrooms. A couple in SF, one for tech and another for biotech (different people, different issues). In NYC, you'd have an open newsroom for tech, and one for finance, fashion, perhaps sports. In every geographic center, you'd have one or more such facilities. The idea developed -- let's put two podiums at either ends of the room with vendors paying to make presentations. There's an EIC for each open newsroom who can also give time to open source projects in all these fields (open source sports and fashion -- interesting). Big high bandwidth pipes emanate from the room, all kinds of video flow in and out. It's a work place and an event space. 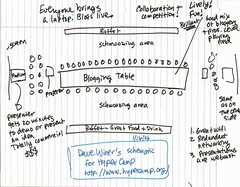 I called these open newsrooms Hypercamp and drew a diagram to illustrate. I'd love to start one in NYC and/or SF. It has to be operated by someone other than me, I'm strictly editorial. Not good at the logistics involved in putting these things together. In the age of realtime networked news this is the new CNN, video would flow out of these facilities 24 hours a day. If you have an event to host, you'd pay to put it in the appropriate Hypercamp. © Copyright 1997-2012 Dave Winer. Last update: Wednesday, June 09, 2010 at 2:14 AM Eastern. Last build: 8/26/2012; 5:37:48 PM. "It's even worse than it appears."